We had the choice to only make one of the cookies, and while I have all the ingredients and a shiny new kitchen scale to make vegetarian marshmallows, I didn't get around to it. I still plan to, hopefully in the next month. What else am I going to use xantham gum for? No really, tell me. I have a big bag of it. Hehe. 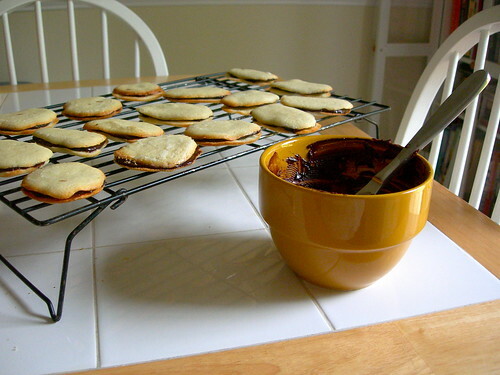 These cookies make me think of family vacations because my Mom would often have a bag of milano cookies in the car on trips to the beach, and we'd each get one as a treat on the road. They weren't hard to make, although it took a while to get the size right, and they are seriously addictive. If I hadn't brought them in to work to share, I'm sure they wouldn't have lasted any longer at home. Any day a Harry Potter book or movie comes out is a self-declared Harry Potter Day. Luckily for the universe, they decided to split the last book into two movies, meaning there will be two more Harry Potter Days in our known world. Two summers ago I made treacle tart and pumpkin pasties, and decided to bring back the treacle tart again this year. I'm hoping by the time the next Harry Potter Day rolls around, I will have mastered modeling chocolate. I'm dying to make chocolate frogs. And if anyone knows where to find Bertie Bott's Every Flavor Bean that Jelly Bellies made in the past, please let me know (although really I needed them for today). Treacle is another name for golden syrup, a light molasses popular in the UK and other places. 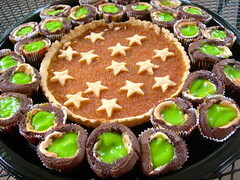 It is delicious, and while I've seen corn syrup used in some treacle tart recipes, it isn't treacle if it isn't golden! 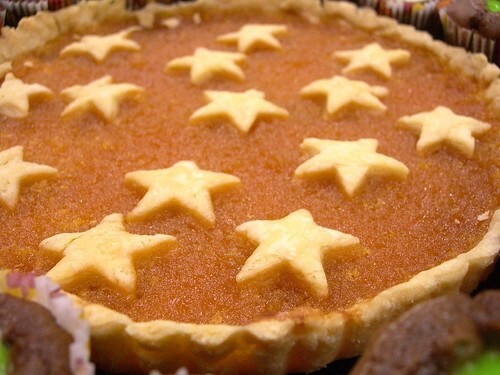 This tart isn't a hit with everyone - it seems like people either love or hate it. The molasses is sweet, sure, but the lemon and ginger really make it a complicated treat. 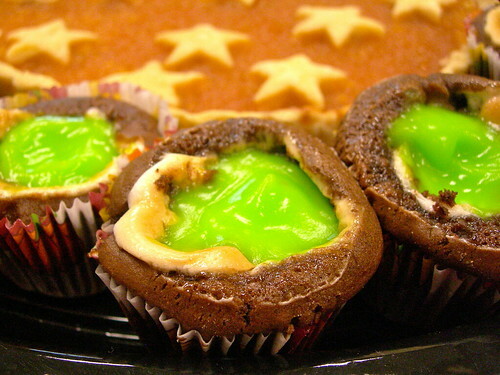 Of course, this is Harry Potter's favorite treat, so to me it belongs on every Harry Potter Day. I really wanted to make a cauldron cake this year, since Harry Potter and the Half Blood Prince chronicles how Harry actually gets quite good at potion making because of whoever the Half-Blood Prince is (didn't want to spoil it for you if you didn't know). A recipe I found on Potterparties.com gave me the idea of putting a marshmallow in the middle of a cupcake prior to baking. After it had baked the full 20 minutes, the marshmallow had bubbled and browned, creating a cauldron in the cupcake that wanted to be filled with something. I wanted something to fit the unreal universe of Harry Potter, so I dyed vanilla pudding neon green. One of my favorite go-to baking books is Bread for Breakfast by Beth Hensperger. When my husband Nathaniel mentioned on Saturday that he was really craving cinnamon raisin bread (but he hates raisins) I thought I remembered a similar recipe in that book. I had just bought more bread flour and yeast in anticipation of playing with Artisan Bread in Five Minutes a Day, so I set to work. 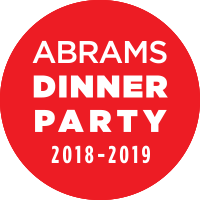 The great thing about this cookbook is I would say at least a third of the recipes are designed to be made (or can be adapted to be made) the night before. So after soaking the oats and proofing the yeast, I mixed the dough - my first bread with my new Kitchen Aid mixer, woo hoo! The directions said the dough would be really soft and not to add too much flour just to make it manageable, so I decided to use the dough hook instead of my hands. It worked brilliantly, and I set it to do a rise, then punched it down and put the dough in the fridge overnight. In the early morning, I woke up, pressed the dough into two rectangles with my fingers, spread the cinnamon sugar mixture across it, rolled up the loaves, and set it to rise. I apparently only have one bread pan, so I keep using a small pyrex as my second one, which means the second loaf spreads out a little more widely (that is the one in the first photo). I also had the mistaken idea that I could go back to sleep. 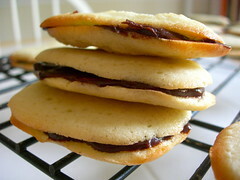 Baking always energizes me; I should know that by now! We didn't wait until it had cooled completely to try it, because we were hungry and it smelled amazing. This bread is really good. It is rich because of the eggs in the dough, and the cinnamon sugar swirl reaches enough of the bread that you get a taste of it in every bite. Toasted and with butter, it was a delicious Sunday morning breakfast. A few days later, the second loaf has been turned into oven baked french toast. I like french toast, but when I make it on the stove I have several problems. If I use butter I always get the pan too hot, so I end up using margarine, and a lot of it, to get that perfect browning on the outside. I've taken to using an oven baked method because I can bake all of it at once, and use far less fat in the recipe (I like to save that for when I eat it!). 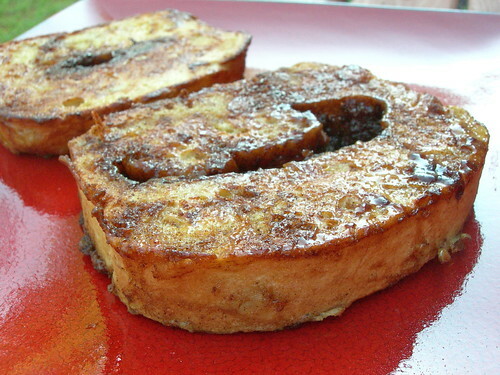 I use the recipe in the Betty Crocker cookbook, but really just use your favorite french toast recipe, and bake it in a 500 F oven, 5-8 minutes on each side. This time around I had to do an additional 5 minutes because the bread was so dense, but you just bake it until it is beautifully browned. It was my birthday two weeks ago, and we have a tradition where I work of bringing the treats for break on our own birthday. Well, that day also coincided with my department's 4th of July picnic, so I decided to make two cakes. I asked around for chocolate cake recipes, because I just haven't found the perfect one yet. Several people said the recipe on the back of the Hershey's Cocoa box was their favorite, so I made it with zero alterations. It was okay. I'm afraid I overbaked it, which is a danger when baking chocolate cakes. 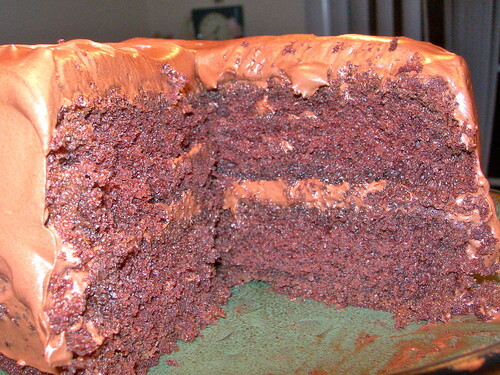 What I have in my head is a cake with more layers, with fudgy ganache and chocolate mousse between the layers. I just ran out of steam. What is your favorite chocolate cake? After I wasn't completely satisfied, I got some interesting recommendations through Twitter, that I've bookmarked to try later. I'm collecting suggestions! 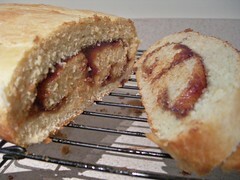 The second cake was the result of being hit by a wacky mood, and the idea to make peanut butter and jelly cake. I feel like someone suggested it to me, but I can't remember who. 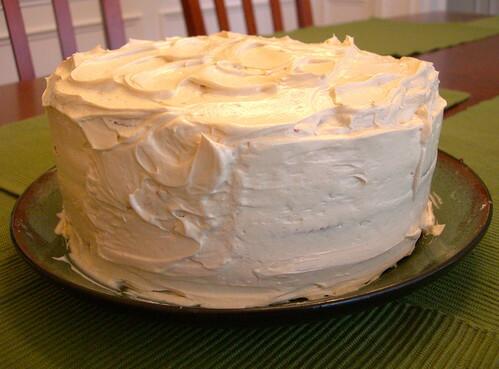 I adapted Dorie Greenspan's recipe for the Perfect Party Cake from Baking: From My Home to Yours, what I consider the quintessential baking cookbook. My theory was that peanut butter has a lot of fat, so I basically substituted peanut butter for some of the butter in the recipe, both for the cake and the frosting. For the cake I used about 1/2 peanut butter but only reduced the butter by 1/4 cup (this was purely by instinct, no idea why these amounts seemed right). For the frosting I replaced an entire stick of butter with 1/2 cup peanut butter. 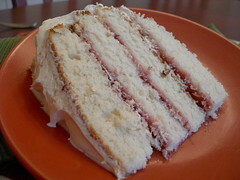 Then I used strawberry jam between the layers and left out the coconut. I really loved this cake. The flavor combo seemed to scream Americana, summer, and fun, and I'd eat this over a pb&j sandwich any day! The basic recipe for this cake seems pretty infallible - I wonder if I could just make a chocolate version!